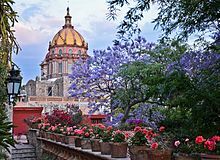 San Miguel de Allende has been nominated for featuring on the main page as Destination of the Month. We may have failed to notice some minor glitches in the article. Please plunge forward and help improve it further before it hits the main page. San Miguel de Allende is a small colonial city in the state of Guanajuato in the Bajio mountains of central Mexico, about 170 miles (270 km) northwest of Mexico City. It's a tourist destination, an art colony, and a retirement community for 12,000 foreigners – mostly Americans, Canadians, and Europeans. In spite of the increased number of foreigners over the past decades, it still is charming enough that many Mexicans visit for special holidays, and there are more than a few visitors who buy a house within a few days of their first arrival. Narrow streets of San Miguel de Allende. San Miguel is, first and foremost, a city built for relaxing. It is a Spanish colonial town of perhaps 140,000 people, a heritage site protected by the Mexican government in order to maintain its character. In July 2008 it was designated a UNESCO World Heritage Site. Founded as "San Miguel el Grande" in 1542 by the Franciscan monk Juan de San Miguel, it became a centerpiece in the war for Mexican independence from Spain. After the war, in 1826, San Miguel was given city status and renamed San Miguel de Allende after Ignacio Allende, a hero of the independence movement, the "first Mexican soldier" and a native of the city. In danger of becoming a ghost town in the early 20th century, the town was declared a national monument in 1926 and building became heavily restricted in the town's historic centro district, allowing the city to keep the colorful native facades that have become the backdrop of many famous works of art and even modern motion pictures. A series of artist colonies were founded in San Miguel in the 1950s, including the famous Instituto Allende, and many American ex-soldiers moved their families here following World War II either to attend one of these colonies or to escape the polio scares raging through many U.S. cities. The result was a healthy American expatriate population that exists today mostly as elderly retirees and second-generation business owners. 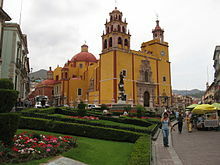 This population, combined with wealthy Mexicans (especially actors and politicians) that have rediscovered San Miguel as a Malibu-like retreat from Mexico City, has created an eclectic mix of Old World Mexican charm, American hospitality, and a party atmosphere that makes San Miguel a world-class destination for adventurous travelers. San Miguel's weather is typical of central mountainous Mexico. It varies little, and even in the hottest months (May and June) when daytime temperatures can reach 35°C, the dry air makes it tolerable and cool mountain breezes tend to make evenings delightful. Winter evenings (from December to February) can get cold, even down to freezing overnight, but it warms up quickly in the morning. The rainy season extends from June to September when days are pleasant for sightseeing until heavy downpours (usually late in the afternoon and evening) cool and freshen the air. The climate has the same lazy, quiet air and temperance as Palm Springs, encouraging long hours of swimming and pool-side tanning, reading or napping, or just lying in a hammock and forgetting the world exists. 20.91454-100.743841 San Miguel Tourist Information (Consejo Turistico de San Miguel de Allende), Plaza Principal 8, ☎ +52 415 152 1695. M-Sa 08:30-20:00, Su 10:00-17:30. Offers street maps and can arrange for Spanish or English tours of the city. Once Upon a Time in Mexico and And Starring Pancho Villa as Himself were filmed almost entirely in San Miguel. One of the most difficult aspects of visiting San Miguel de Allende is getting there. Its remoteness is definitely part of the charm of the city. Your afternoon nap will never be disturbed by the sound of an overhead plane or a train pulling in, but reaching San Miguel, and eventually escaping, can be a problem if you do not understand your options. If you're an experienced driver in Mexico, you'll have few problems reaching San Miguel. It's less than two hours from Léon and one hour from Querétaro, and maybe a three-hour drive from Mexico City. The only difficulty will come when you reach San Miguel. Parking spaces are at an absolute premium here, so you'll want to arrange to have a spot for your car waiting when you arrive. Additionally, the cobblestone streets were not designed for modern traffic, so driving around San Miguel can be a challenge. Most people walk or take a US$2 cab ride anywhere downtown. If you've never driven much in Mexico, driving to San Miguel is not difficult. While San Miguel is on the side of a mountain ridge, most of the roads leading to it are in excellent condition and safe to drive, at least during the day. Since much of this area is "free range" land, horses and cattle may find their way on the road, especially at night. Seniors and tourists touring the region may find sightseeing more difficult because of the locals' propensity to drive fast along these two-lane highways. It's not much fun having a car on your bumper while trying to see the beautiful countryside in this area. Slower drivers often drive partly on the shoulder to let faster traffic pass. Your best bet is flying into Leon or Mexico City, and taking a shuttle or bus to San Miguel. Then you do not have to worry about parking you car, which is of little use once you arrive. The closest airports to San Miguel are the Aeropuerto Bajío/León (BJX IATA), next to the town of Silao, about 56 miles (93.5 km) west of San Miguel de Allende and Aeropuerto Querétaro (QRO IATA), north of the city of Querétaro, about 52 miles (86.5 km) southeast of San Miguel de Allende. Arriving at either of these airports will reduce your final journey to a relatively inexpensive (US$30-60) hour shuttle or cab ride into town. American Airlines, Delta and United offer direct flights to Leon from Dallas-Ft Worth, Atlanta and from Houston, respectively. Delta and United also offer direct flights from Los Angeles to Leon as well. A bus ride from Querétaro is even cheaper (around US$10-15), but the trip will take 2.5-3 hours because the bus is not direct to San Miguel and you have to take a taxi from the airport to the bus station. Colectivos from the bus station to the city center are much cheaper at M$5 pesos. Your flight may be less expensive if you go through Mexico City (MEX IATA), and connect to a flight to Leon or Querétaro. Otherwise, Primera Plus offer hourly buses from Mexico City's Benito Juarez International Airport to Queretaro and Celaya where you can transfer to another bus to San Miguel. However, it's a 4-5 hour trip. If you fly into Mexico City and need to reach San Miguel, do not try to take a taxi from the airport. The taxi drivers in Mexico City are well-trained to cheat you by charging you three or four times the cost of a trip to San Miguel. It's simply not worth the hassle. If you're hell-bent on flying into Mexico City and not taking a bus, call ahead to the hotel or B&B where you're staying and ask them to send a taxi from San Miguel. Yes, they may charge you for both the trip to and from the airport, but it will be infinitely less expensive than if you try to pick up a taxi from the street outside the Mexico City airport. It is very important not to pick up a taxi from the street outside the Mexico City airport for safety reasons, in any case. Take one of the official airport taxis to your hotel. These "Transporte Terrestre" taxis are the only ones allowed inside the airport. You will buy a zone-priced ticket ahead of time inside the airport by walking all the way down to the right (several hundred meters/yards) after exiting the international arrivals area. If you fly into a regional airport like Léon or Querétaro, taking a taxi the rest of your way is much safer. Just make sure you use an approved taxi service (the green and white cars are official taxis). Even still, if you don't know San Miguel that well, you may want to consider calling ahead to your hotel or B&B and having them provide transport. Regional taxis may know how to get you to San Miguel, but only a taxi or car sent by your lodging will know how to get you straight to them. By far the most convenient airport to fly into is Leon (BJX). Arrange for a ride beforehand with one of the many shuttle services listed on San Miguel websites. Average price about US$25-30 per person. This will almost always be cheaper than taking a taxi from the airport, and the driver will know the town of San Miguel much better than a taxi driver from the airport. There is no easy way to get from the Leon airport to San Miguel by bus. Perhaps the best option for getting to your hotel, casa or B&B is to pre-arrange pickup at your arrival airport. The driver will meet you inside the terminal, in the area where you clear customs. The rates are US$70-120. A 6-passenger SUV will be the highest and a sedan for three is around US$70. You can arrange transportation through your hotel, etc., or book direct. 20.91311-100.744052 Peradora Agencia de Viajes, Cuna de Allende 17, ☎ +52 415 152 8011. An independent travel agent that sells first-class tickets for Primera Plus and ETN bus lines. Maybe 90% of San Miguel's attractions are within walking distance. Just keep in mind that because San Miguel was built into the side of a mountain, it can turn out to be difficult to traverse, some inclines are 15 or 20 degrees. Furthermore, the streets are cobbled and narrow – some were nothing but goat tracks before they were paved – and many have fallen into disrepair. Curbs are often a high step away from the road. All in all, the town can be unforgiving to an inexperienced walker. For this reason, it is advisable to bring comfortable shoes. Driving in San Miguel can be challenging due to very narrow streets and limited parking, and is best avoided. There was a time when the city was not so wealthy and only taxis could be found on these roads. Now that the real estate market has boomed, an influx of money has made cars more affordable and now the average resident is more likely to own one – good news for the economy, but bad news for the roads. Many two-way streets in San Miguel are too narrow to support two lanes of traffic, and it's not uncommon for a street to become so choked with cars that drivers have to get out and negotiate which one is going to back up to a wider street to let the other pass. Many streets are one-way and indicated by arrow signs placed on the sides of buildings; a double arrow indicates a two-way street. Watch out for very steep streets. They can get even steeper than you realize and at least one in San Miguel is so narrow at the bottom that no more than a medium-sized car with its side mirrors pulled in can safely maneuver between the buildings. Scratches on the walls attest to drivers who have literally had to scrape between the buildings. Backing up the hill is usually not an option. Following a city bus is a good way to guarantee not getting into a tight situation. On-street parking regulations are widely ignored by Mexicans. If you park on the street, do NOT leave it parked for more than 24 hours (There are no signs warning about this). Parking violations may result in the transit police removing your license plates. You will then need to find the police station, pay a fine, and hope that your plates are returned. A better alternative is that there are several paid parking lots in town; look for 'E' signs indicating Estacionamento (parking). Catch a taxi to any destination within central San Miguel for M$35-40 (2016), and M$40-50 after dark. In-town taxis are abundant and a great option after an afternoon of shopping. Taxis do not use meters and the price should be confirmed first. Taxis in front of the bus station are notorious for over-charging; most locals walk a few meters past them to flag down a cab on the street. If calling for a taxi to pick you up, the price doubles. If planning a late night out, most taxi drivers can be trusted to keep an appointment if the pickup time is arranged in advance. San Miguel has its own pleasant and reliable bus system that serves the entire town, including out-of-the-way places like the Luciérnega Shopping Center and the bus depot. Buses are called urbanos and run from 07:00-21:00 daily for a flat rate of M$5 inside the city center (single ride, no transfer, driver gives change). The schedule is every 15-20 minutes in the central city; every 1-2 hours to and from outlying areas in the municipality. Routes are never referred to by their number but by the name of the destination. There is no route map. Destinations are generally marked or painted on the side or on the windshield. 'Centro' means downtown and 'Central' means bus station. Buses are white with color-coded trim. All the blue-white and orange-white buses pass the stop opposite the Oratorio de San Felipe Neri downtown. Yellow-white buses make a circle around town passing near centro and central. All red-white, green-white, purple-white buses and some yellow-white buses connect to the outlying suburbs and are boarded at various stops located several blocks outside the center of town. Two different companies provide sightseeing rides using trolley-looking buses that cost M$60. You can ask for tickets in the main tourist office just in the main square. The ride lasts 1½ hours (if traffic allows) and reaches the top of hill 'El Mirador' for a fantastic view of the town. 20.91357-100.743741 Parroquia San Miguel Arcángel, Plaza Principal s/n (by the Jardín), ☎ +52 415 152 4197. Daily 08:00-20:00. The marvelous pink granite parish, looking like an ornate candy sculpture. The building itself dates from the 16th century, while the façade was designed in the 19th century by self-taught indigenous architect Zeferino Gutíerrez, who is said to have been inspired by a postcard depicting a European Gothic cathedral. 20.91463-100.745842 Templo de la Inmaculada Concepcíon (Las Monjas), Canal y Hernández Macías s/n, ☎ +52 415 152 0688. Daily 09:00-18:00. Next to the Bellas Artes and part of the former convent, this church was constructed in the mid-18th century. The massive dome is said to be a copy of Les Invalides in Paris. 20.9153-100.74513 Teatro Angela Peralta, Hernández Macías 82, ☎ +52 415 152 2200. Named after a famous Mexican opera singer who inaugurated the theater in 1873, this is one of San Miguel's principal venues for concerts and performances. It is not normally open to the public except during events. 20.91628-100.742324 Oratorio de San Felipe Neri, Insurgentes s/n, ☎ +52 415 152 0521. Daily 09:00-18:00. Completed in 1714, the church features a delicately-carved pink sandstone façade. 20.91628-100.741625 Templo de Nuestra Señora de la Salud (Church of Our Lady of Health), Plaza Cívica s/n. Daily 09:00-18:00. Built in the 17th century and notable for the scalloped stone dome over the main entrance. 20.91468-100.742526 Templo de San Francisco, San Francisco s/n, ☎ +52 415 152 0947. M-Sa 08:00-14:00, Su varies. Built toward the end of the 18th century, this is a good example of Mexican Baroque architecture. 20.91431-100.744238 Casa del Mayorazgo de la Canal (Casa de Cultura Banamex), Canal 4, ☎ +52 415 152 7584, e-mail: rodolfo.sanchezamargos@banamex.com. M-F 09:00-18:00, Sa Su 10:00-18:00. The former home of a very wealthy family and now housing a bank. The courtyard is open to the public, and occasional art exhibits are shown on the ground floor. Visitors must sign in; no photography permitted. Free. 20.91503-100.745579 Centro Cultural Ignacio Ramírez (Bellas Artes / Convento de Nuestra Señora de la Concepción), Hernández Macías 75, ☎ +52 415 152 0289, e-mail: bellasartessma@hotmail.com. M-Sa 10:00-19:30, Su 10:00-14:00. This former convent is now an art school and cultural center, and hosts rotating exhibits by local and international artists. Of particular note is an unfinished mural on the ground floor by David Alfaro Siqueiros, a contemporary of Diego Rivera. Free. 20.91686-100.7380410 Another Face of Mexico Mask Museum (La Otra Cara de Mexico), Cuesta de San José 32 (Colonia Azteca), ☎ +52 415 154 4324, e-mail: info@casadelacuesta.com. By appt only. A private collection of over 500 Mexican ceremonial masks. M$100 (adults), free (children/students). 20.91474-100.7400711 La Esquina Popular Mexican Toy Museum (La Esquina Museo del Juguete Popular Mexicano), Núñez 40, ☎ +52 415 152 2602. W-Sa 10:00-18:00, Su 11:00-16:00. This museum collection is housed in a historic building, and includes a range of antique and modern hand-made toys. M$30 (adults), M$20 (children/seniors/students/teachers). 20.91423-100.7437712 El Jardín (Jardín Allende, Plaza Principal). This central plaza with manicured trees is always buzzing with activity and is a good place for people-watching. 20.91583-100.7415313 Statue of Ignacio Allende, Plaza Cívica. 20.91256-100.7449614 Casa del Inquisidor, Cuadrante 36. An 18th-century mansion and the former office of the Inquisition was located in this building, now a private home. Directly across the street is the former jail for the Inquisition. Semana Santa (Holy Week). The week before Easter. Celebrated with impressive and touching parades. Fiesta de los Locos (Feast of Fools). The first Sunday after 13 June (feast day of St Anthony of Padua). This annual parade is unique to San Miguel, with thousands of participants clothed in outlandish and colorful costumes and tossing candy into crowds of spectators. The parade begins around 11:30 at the Templo of San Antonio and winds its way up Hernández Macías, Insurgentes, and San Francisco Núñez before terminating at the Jardín. Free. Expresión de Corto, Fábrica la Aurora, Local 5-B, ☎ +52 415 152 7264, fax: +52 415 152 8899. Last week of July. An annual short film festival, co-hosted by the nearby city of Guanajuato. Hundreds of films from nearly all genres are screened in venues including the Jardín and in the Centro Cultural Ignacio Ramírez. Most films are subtitled in Spanish and English. Free. San Miguel Chamber Music Festival (Festival de Música de Cámara de San Miguel de Allende), Hernández Macías 75, ☎ +52 415 154 5141. Late July and early August. An annual festival featuring internationally renowned quartets and soloists. Concerts are held in a number of venues, including the Teatro Angela Peralta. Independence Day (Día de la Independencia de México). 16 September. Día de San Miguel Arcángel (St Michael's Feast Day). Late September. A week of festivities celebrating the Feast Day of San Miguel's patron saint. International Festival of Jazz & Blues (Festival Internacional de Jazz & Blues), e-mail: sanmigueljazz@yahoo.com.mx. Mid-November. 20.91827-100.728211 El Charco del Ingenio Jardín Botánico (Jardín Botánico), Paloma s/n (uphill past Los Arcos, then take a left), ☎ +52 415 154 4715, e-mail: charcodelingenio@gmail.com. Daily 09:00-18:00. Unique park above the town with an enormous collection of cacti. A vast area just past the Balcones area which includes some of the older engineering installations (an old mill and raceway), lovely canyons, well informed guides (mostly expats) for the botanists and birdwatchers. Go early in the day to avoid the heat and for more wildlife. Locals who are members are sometimes given a key to the back gate – find one and buy him beers until he relents! The reservoir is host to a number of migratory birds, and the locals can be rather stunning as well. M$40, M$80 (guided tours). Guided birdwalks, ☎ +52 415 152 3644. 1st and 3rd Wed of every month 09:00-11:30. Tours are conducted in English, and meet inside the main entrance. M$100 (nonmembers), M$60 (El Charco or Audubon Society members). 20.9087-100.74282 Parque Juarez (Benito Juarez Park). This well-used park is comprised of many old fruit orchards, and is now a favored nesting area for white egrets. 20.90909-100.74683 Audubon Society Birdwalks. Meets on the 3rd Sunday of every month at 07:45 in front of the Instituto Allende (see listing under 'Learn'). The only chapter of the Audubon Society in Mexico, this group offers guided birdwalks to locations within and near San Miguel. Destinations include the El Charco del Ingenio Jardín Botánico (see listing above), the Río Laja, and the Presa Allende. Participants travel by carpool. M$150 (nonmembers), free (members). Coyote Canyon Adventures, ☎ +52 415 154 4193, +52 1 415 153 5005, e-mail: info@coyotecanyonadventures.com. Offers horseback riding, hiking, biking, rappelling, camping, four-wheeler (ATV), hot air ballooning, boating, Cañada de la Virgen pyramid tours, and multi-day cross country adventures. Their guides lead you safely through working cattle ranches, into canyons, through rivers, over plains, across gorges, and down sheer cliffs, all the while sharing with you their in-depth knowledge of the native flora and fauna. 20.91283-100.740614 Bici-Burro Cycling, Hospicio 1, ☎ +52 415 152 1526, e-mail: beto@bici-burro.com. A bike shop that has operated in San Miguel since 1963. They offer bike rentals and biking or hiking tours with guides that hold an intimate knowledge of the area around San Miguel. You have the choice of seven bike tours and two hiking trips which take you amongst natural landmarks and some of the historical ruins of the area. These are of varying degrees of difficulty and range from 5 to 8 hours. The bicycle tours include a 2- speed aluminium mountain bike with helmet, gloves and transportation if needed. Several schools offer classes and arrange a 'home stay' with a host family for a very good price. 20.9197-100.742582 Habla Hispana Spanish School, Calzada de la Luz 25, ☎ +52 415 152 0713. Spanish classes at Habla Hispana are focused on enable students to communicate effectively. Emphasis is placed on verbal interaction in the classroom, and class placement is based more on verbal fluency than on academic knowledge. Spanish classes at Instituto Habla Hispana are designed as four-week sessions and divided into three levels: Nivel Principiante (Beginner), Nivel Intermedio (Intermediate), and Nivel Avanzado (Advanced). The school is flexible in working with students who cannot stay for four-week sessions and also will work with you on focused Spanish for medical professionals. Comfortable and affordable accommodations are available in a residence on same school grounds as well as homestays with local families. Program also includes cultural tours, music and cooking. 20.90909-100.74683 Instituto Allende, Ancha de San Antonio 22, ☎ +52 415 152 0929, +52 415 152 0190, fax: +52 415 152 4538, e-mail: recepcion@institutoallende.edu.mx. M-F 09:00-11:00 or 15:00-17:00. The oldest school of arts and language in Latin America, housed in a former 17th-century palace. Offers month-long courses of 1-6 hours a day are offered, for all levels. 20.90696-100.751454 Language Point (Languages), 20 de Enero Sur 42 (SW of the Jardín), ☎ +52 415 152 4115. 08:00-14:00. Spanish by speaking. Learn in groups of 3 maximum. Spanish lessons are designed to teach you the tenses and vocabulary. The small class size allows real conversation, even for beginners. US$143/week. 20.92148-100.742355 MexArt: Summer Teen Institutes, Calzada de la Aurora 48 (Casa Carly), ☎ +52 415 152 8900, e-mail: carly@gomexart.com. MexArt Summer Teen Institutes are one-month programs where students may focus on art or dance and Spanish language while immersed in Mexican culture. Students live in a central B&B with experienced counseling staff. MexArt excels in teaching the visual arts, dance, and Spanish. Participants choose one area in which to focus and choose other areas with which to experiment. Open to students ages 14-18. San Miguel's many art institutes are always open to travelers looking to discover (or become the next) Frida Kahlo. Painting, sculpture, printmaking, photography, you name it and it's probably there. 20.91503-100.745576 Centro Cultural Ignacio Ramírez (Bellas Artes / Convento de Nuestra Señora de la Concepción), Hernández Macías 75, ☎ +52 415 152 0289, e-mail: bellasartessma@hotmail.com. M-Sa 10:00-19:30, Su 10:00-02:00. This former convent is now an art school and cultural center, and offers classes and workshops in painting, drawing, sculpture, textiles, and ceramics. 20.90909-100.74687 Instituto Allende, Ancha de San Antonio 22, ☎ +52 415 152 0929, +52 415 152 0190, fax: +52 415 152 4538, e-mail: recepcion@institutoallende.edu.mx. M-F 09:00-11:00 or 15:00-17:00. The oldest school of arts and language in Latin America, the Instituto offers accredited undergraduate degree programs, an international Master of Fine Arts (MFA), and art and photography workshops for travelers and the general public. 20.92335-100.740348 Fábrica la Aurora, Calzada de la Aurora s/n (Colonia Aurora), ☎ +52 415 152 1312. A number of resident artists with studios here offer classes and workshops in a variety of media. The streets around the Jardín are full of specialty shops selling common souvenirs, clothing, art, furniture, and Mexican tile, and any other type of Mexican artwork that you can think of. In addition to its cultural staples, San Miguel de Allende is known for its amazing shopping. Being near the geographical center of the country, artisans from every part of Mexico have been known to send their artwork to San Miguel to be sold. Whenever possible buy directly from the artisan. Many amazingly talented artists are not able to support their families due to the low prices they receive for their art. At times it is very necessary to bargain and at other times inappropriate – use your intuition and allow for mistakes. Ladies: don't forget to pick up a pair of San Miguel shoes as soon as you arrive. Your walk around town will be much more comfortable. 20.92335-100.740341 Fábrica la Aurora, Calzada de la Aurora s/n (Colonia Aurora, a 10 min walk from the Jardín), ☎ +52 415 152 1312, fax: +52 415 152 1312. The best place to get great quality Mexican and international art. This old textile factory has been converted into a unique art and design center that now houses over 30 artists, galleries, restaurants, antique shops, and specialty stores. Artists are usually in-house and demonstrating on Thursdays. Open late on the first Saturday of each month. 20.90621-100.725133 Tianguis de los Martes (Tuesday Market), Salida a Querétaro (take bus 8 or 9 from the Plaza Civica on Mesones). Tu 08:00-16:00. A colorful market with acres of native crafts, cheap Lakers t-shirts, fly swatters, cheap leather jackets and miscellaneous stuff that you really need, like flypaper, sewing kits, and more flyswatters. This is the place to pick up the best produce in town, as well as local cheese, honey, and sausage. Fresh seafood is trucked in overnight from Veracruz. Also on offer is an enormous variety of street food, from gorditas and tacos to fresh fruit juices. 20.91663-100.741184 Mercado Ignacio Ramirez (Mercado El Nigromante), Colegio (a few blocks from the Jardín. The main entrance is at the north end of Colegio Street). Open daily. A large indoor market with sections devoted to fruits and vegetables, meat, flowers, shoes and clothing, fast-food, ceramics, and souvenirs. Connected to the Mercado de las Artesanías - see below. 20.89686-100.75276 [dead link] Mega Comercial Mexicana, Carretera a Celaya 2, ☎ +52 415 120 2029. Daily 07:45-22:00. This branch of the large hypermarket chain has a deli, bakery, and pharmacy, as well as clothing and electronics. Also located at the front of the store is a café, optometrist, and GNC. A taxi stand is located just outside in the carpark. 20.9133-100.744651 Café de la Parroquia / La Brasserie, Calle De Jesus 11 (one block from the Jardín), ☎ +52 415 152 3161. Café de la Parroquia: 08:00-16:00; La Brasserie 18:00-22:00. Beautiful courtyard dining on fresh, local ingredients. Although many menu items seem at first to be the "usual", there's nothing ordinary about them. Try in particular the chicken soup (throw in all the onions and cilantro), tacos and any omelette. US$6-12 entrees. 20.91342-100.742972 Cafe La Ventana, Diez de Sollano 11, ☎ +52 415 154 7728, e-mail: josefinavalentini@yahoo.com. M-Sa 08:00-21:00, Su 09:00-15:00. Has good breakfasts and great coffee. Practices Fair Trade. 20.90834-100.752663 Cafe San Antonio, Refugio Sur 24, ☎ +52 415 152 3016. Regional, national and international cuisine. Enjoy your breakfast, lunch or dinner in a luscious and open courtyard in the heart of Colonia San Antonio, under the century old native mesquites, pines and pirules. Truly a unique experience. 20.92291-100.741924 Café Yenatu Panza, Calzada de la Aurora 48 (follow Hidalgo out of the Jardín until it turns into Aurora), ☎ +52 415 152 8900. Daily 08:30-12:00. This is undoubtedly the most innovative and creative breakfast menus in town featuring design-your-own omelets & breakfast burritos, exquisite French toast, and home made fruit salsa. The vibe is very comfy and clients can choose from indoor or outdoor-garden seating. There's even free wireless. M$5-7. 20.91446-100.742065 Cafetería San Agustín, San Francisco 21, ☎ +52 415 154 9102. Daily 08:00-23:00. A well-run restaurant with great food, Mexican and international. The restaurant/cafe in proud of their freshly made churros and a variety of hot and cold chocolate milks. Owned by Margarita Gralia. 20.91381-100.745836 [dead link] Casa Payo, Zacateros 26, ☎ +52 415 152 7277. One of the most traditional restaurants offering Argentine cuisine, with Mediterranean ambience inside dining and exterior in a charming patio featuring live music. 20.91146-100.750487 Cha Cha Cha, 28 de Abril Norte 37 (Colonia San Antonio). Daily 13:00-19:00. Owned and operated by Mexican couple. 20.91391-100.742268 El Correo, Correo 23 (a block away from the main square), ☎ +52 415 152 4951. A small Mexican food spot which offers simple yet interesting authentic Mexican food in a great location. 20.94695-100.757189 Grill & Garden (formerly Bistro Los Senderos), Libramiento SMA-Dolores Hidalgo Km 3.5 (8 minutes N of San Miguel), ☎ +52 415 155 9594, e-mail: info@bistrolossenderos.com. F-Su 13:00-19:00. Relaxed country atmosphere serving old favorites and innovative fusion dishes – the restaurant has its own organic herb and vegetable garden. Great place to take visitors, and kids – bicycles available and horse back rides by reservation. Gets very busy on Sundays, reservations recommended. This charming place also prepares gourmet picnics, and available for private events. M$200-400. 20.91271-100.7440410 La Grotta, Cuadrante 5, ☎ +52 415 152 4119. Daily 14:00-22:00. A wonderful, multi-story restaurant owned by Daniel and son Dyami. La Grotta is located downhill, around the corner, just a block from the main cathedral. The restaurant is casual and the main items are pizza, calzones, and Italian-related. The food is very carefully and freshly prepared. 20.91667-100.7430611 Juan's Cafe Etc (Café Etc. ), Relox 37, ☎ +52 415 154 8636. Daily until 16:30. Great breakfasts and coffee. Practices Fair Trade. 20.91407-100.7421912 El Pegaso, Corregidora 6 (just off the Jardín), ☎ +52 415 154 7611, e-mail: elpegasomx@gmail.com. Daily 08:30-22:00. This trendy cafe style restaurant offers a delightful blend of Mexican and international flavor. Its atmosphere is definitely one of the best in town. 20.91336-100.7440813 Posada Carmina, Cuna De Allende 7, ☎ +52 415 152 8888, fax: +52 415 152 1036, e-mail: hotel@posadacarmina.com. This restaurant is based in the patio of a charming inn located in a remarkably well preserved colonial house. Branded as 'fusion', the food offered by this restaurant will make your visit to San Miguel even more memorable, it mixes the classic elements of Mexican cuisine with oriental flavors and dishes. 20.9139-100.7444814 Restaurante Mama Mia, Umaran 8 (S of the Jardín, half a block from the Parroquia), ☎ +52 415 152 2063, e-mail: contactosanmiguel@mamamia.com.mx. Su-Th 08:00-03:00, F Sa 08:00-05:00. An open air patio restaurant with a stage and an exterior/second floor patio. The restaurant has traditional Mexican dishes, but specializes in pizzas and pastas. An always packed space, this is an amazing place to eat with a clean kitchen, and a lively bar. 20.91408-100.7418315 El Rincon Español, Correo 29. Administered and owned by a Catalan immigrant. 20.9099-100.7518516 El Rinconcito, Refugio Norte 7 (Colonia San Antonio), ☎ +52 415 154 4809, e-mail: mercigo70@gmail.com. W-M 13:00-21:00. Try the Mar y Tierra. 20.92312-100.7538617 Tacos Don Felix, 15th Fray Juan de San Miguel, ☎ +52 415 152 5719. F Sa 18:00-24:00, Su 14:00-18:00. Wonderful soups, nachos, and entrees. Try the Three meats enchiladas. Friendly service. Moderate. 20.91574-100.7451618 Tio Lucas Restaurante Bar, Mesones 103 (across from the Teatro Angelica Peralta), ☎ +52 415 152 4996, e-mail: tiolucassma@hotmail.com. If you can't find something to do in San Miguel at night, you're not looking hard enough. If you can't find something to do on a Saturday night, you're outright blind. This city is filled with clubs, bars, dance halls, and restaurants, and almost all of them have some plan for every night of the week. Following are just a few options, try these out, but also seeking your own favorite hang-out. 20.91406-100.745531 Berlin Bar & Bistro, Umaran 19, ☎ +52 415 154 9432, e-mail: reserv@berlinmexico.com. Daily 17:00-01:00, dinner served until 23:30. For a great nightcap, Berlin is a great chill bar. The owner is very welcoming and the food is sublime. 20.91387-100.742072 La Cava de la Princesa, Recreo 3, ☎ +52 415 152 1403. Showcases musicians from Mexico City. Cover charge depends on the band. 20.91406-100.744893 El Grito Night Club, 15 Umaran (about a block from the Jardín), ☎ +52 415 120 0156, e-mail: elgritonightclub@gmail.com. F Sa 22:00-04:00, holidays. This is arguably the most popular club in town, and easily the most expensive. It has a US$15 cover charge, enough to dissuade the casual visitor from dropping in to take a look. Inside, the building is a panoply of stone and glass sculptures, light displays, and music. How energetic the evening gets usually depends on the crowd, but it's hard for the evening to get much past midnight before the dancing starts. El Grito is only open Fridays and Saturdays, or on certain holidays, like New Year's Eve (when they jack the price up to US$50). 20.9139-100.744484 Mama Mia, Umaran 8 (a few doors from the Jardín), ☎ +52 415 152 2063, e-mail: contactosanmiguel@mamamia.com.mx. Su-Th 08:00-03:00, F Sa 08:00-05:00. Mama Mia's is four clubs in one. There's a restaurant and bar in the center with some amazing Italian food, a sports bar to the left (usually displaying a soccer or football game of some kind), a music bar to the right where local acts frequently play (especially Pilaseca, a very popular funk-blues band that tours most of Mexico and the States), and a hard-to-find rooftop lounge overlooking the city. This is a great default place to while away the hours when nothing else is appealing – the music is worth it, if nothing else. 20.91276-100.746075 Manolo's Sports Bar, Zacateros 26, ☎ +52 415 152 7277. Daily 15:00-23:00. Complete coverage of national and international sports – if it is on TV they have it. 20.90103-100.747171 Casita San Miguel, Colonia Allende (20 min walk from the Jardín), ☎ +52 415 117 7223. Check-in: 12:00PM, check-out: 2:00PM. A clean, comfy and friendly alternative to lonely, boring hotels, the Casita is social like a hostel, but far more private — and much kinder to your budget. Includes a fully-equipped kitchen where guests can cook any time. Clean and well-maintained. M$390 and up. 20.91936-100.744473 Hostel Inn, Calzada de la Luz 31a, Zona Centro, ☎ +52 415 154 6727, e-mail: hostelinnmexico@yahoo.com. Price depends on the season, see their website. There's a laundry service with same day pickup. Dorms around M$150. 20.91014-100.741734 Hostal-Hotel Internacional, Recreo 80, ☎ +52 415 121 0698, e-mail: smainternacionalhostal@hotmail.com. Dorms M$150. 20.92068-100.745015 Iron House Hostel, H Colegio Militar 17-D, Col. Guadalupe (8-min walk from the Parroquia), ☎ +52 415 154 6108, e-mail: ihh_sma@hotmail.com. Independent hostel. Ricardo, the owner, is a resident of San Miguel and is always happy to show you the real gems of the town: the best sights, clubs, restaurants, bars, hot springs, artisanal markets. Weekly and monthly rates available. US$25 private room, US$10 dorm. 20.92176-100.74266 Casa Carly, Calzada de la Aurora 48, ☎ +52 415 152-8900. Check-in: 2PM, check-out: noon. Seven charming casitas (small houses) surrounding a beautiful garden. Each casita has a kitchenette, coffee maker, TV, DVD player with a huge selection of films, Wi-Fi. On the grounds is one of the best breakfast cafes in the entire town (not included in room rate). US$75. 20.91394-100.741827 Casa Carmen, Correo 31, ☎ +52 415 152 0844. Bed and breakfast close to El Jardin. Eleven rooms start at US$92 per night, US$24 per additional guest. Breakfast and lunch are served in a comfortable dining room. The food is outstanding - including soup, main course, and dessert at lunch time. There is also an interior courtyard and rooftop garden. Owner is very warm and friendly. US$92 and up. 20.91583-100.744979 Casa Florida, Hernandes Macias 60 (2 blocks from the main Jardin), ☎ +52 415-154-8195 (Mexico), +1 813-480-0505 (USA). 3 wonderfully designed rooms, full breakfast, roof garden, great sunset and close to El Jardin. US$99. 20.91399-100.7403710 Casa Mia Suites Apartments, Correo No. 61 Int 1 Col. Centro CP, ☎ +52 415 152-2757. Each room has a terrace, private toilet and bath with toiletries, living room, and fully equipped kitchen. High-speed Internet, car hire, currency exchange, and laundry/dry cleaning. US$110 and up. 20.9177-100.746511 Casa de la Noche, Organos #19, Centro. A former brothel (or "house of the night") that has been converted into a very charming guest house with rooms and suites. 5 minutes from El Jardin and Parrochia. The grounds are beautiful with Mexican handiwork evident everywhere. Rooms, US$40 and up; suites with kitchenette, US$100 and up. Weekly and monthly rates are available..
20.90595-100.7488412 Real de Minas, Camino Viejo Al Panteón 1 (Calle Ancha San Antonio). Great location near downtown. Inside this colonial-style building you will find a water well. People say Miguel Hidalgo, Mexico's independence hero, used to drink this water when he was in San Miguel. US$100. 20.91411-100.7468113 Dos Casas Hotel, Quebrada 101, ☎ +52 415 154 4073. Contemporary designed boutique hotel, 2 blocks from the center. Includes wine bar and restaurant. 20.9108-100.733114 Hotel El Atascadero, Prolongacion Santo Domingo S/N,, ☎ +52 415 152 0206. One of San Miguel's oldest family-owned hotels. Once home to a famous bullfighter, a silk plantation, and has been for decades a retreat for artists such as Diego Rivera and Pablo Neruda. 20.9094-100.74515 Rosewood San Miguel de Allende, Nemesio Diez 11, Col. Centro, ☎ +52 415 120 3500. Luxury boutique resort with accommodations, on-site restaurants, SENSE, A Rosewood Spa and space for meetings, weddings and events. 20.9884-100.727716 Sagrada Wellness, La Mesita 11, Rancho La Mesita (15 min out of town). A retreat. San Miguel is not only a wonderful visit because of the town, but also spectacular for its gorgeous countryside. Sagrada's quiet and tranquil location is high up in the country with views of the high desert. Cabanas and canvas bungalows are spacious and with modern amenities. Architecture is amazing - very modern and built with sustainable materials. Food, yoga, and other spa treatments are offered separately. 20.913-100.747317 Villa Mirasol, Pila Seca 35, Centro (4 blocks from the main square), ☎ +52 415 152 6685. Converted colonial home with 12 rooms and suites. US$100-150. San Miguel de Allende, while perhaps safer than other tourist destinations in Mexico, can be unsafe. Most tourists don't have a problem when visiting San Miguel de Allende, but you should still exercise caution while on your visit. Use common sense, keep your valuables and cash out of sight and stay in well lit areas at night. 20.91408-100.742399 [dead link] Central Post Office (Correos de Mexico), Calle Correo 16 (on the corner of Corregidora, one block from the Jardín), ☎ +52 415 152 0089. M-F 08:00-16:00, Sa 08:00-12:00. 20.91668-100.7433510 Public Library (Biblioteca Pública), Insurgentes 25, ☎ +52 415 152 0293, toll-free: +52 415 152 7048, e-mail: gm@bibliotecasma.com. M-F 10:00-19:00, Sa 10:00-14:00. Has one of the largest bilingual collections in Mexico, with over 30,000 titles in English, and operates a small gift shop and café. Free wifi is available throughout the building. Temporary membership $100 MXN refundable deposit, + $20 MXN (nonrefundable). Atención San Miguel is a weekly bilingual newspaper that is the main source of local news for English speaking residents and visitors. The calendar of the week's events is particularly useful. Atención is published on Friday and is widely available at newsstands and businesses (15 pesos). Green Map San Miguel uses an interactive map with layers of information on sustainable living in San Miguel. Look here for information on restaurants that serve organic and/or local food, recycling and composting, greentech businesses, green organizations and bus routes. 20.9033-100.7273811 United States, Plaza La Luciernaga, Libramiento Jose Manuel Zavala No. 165, Locales 4 y 5, Col La Luciernaga (Plaza la Luciernaga Mall at Blvd Conspiracion and Lib Jose Manuel Zavala in the southeastern part of town), ☎ +52 415 152 2357, fax: +52 415 152 1588, e-mail: ConAgencySanMiguel@state.gov. M-Th 09:00-13:00. Consular Agency is part of the US Embassy in Mexico City. Thermal pools just outside of town for an afternoon of relaxation. Hail a taxi or grab a bus for just a few dollars to these pools, but be sure to arrange return transportation or know when the last bus arrives. The only hotel near the pools is said to be expensive and generally booked. Atotonilco is a historic church approx. 10km outside of SMA. The sanctuary services as a piligramage desitination and the site where Ignacio Allende met up with Father Hidalgo to begin their fight for Mexican Independence. Guanajuato, the capital of the state. It is known for its network of tunnels under the city and for its "Museo de las Momias" (mummy museum), and you can also see Cristo Rey atop the Cerro de Cubilete. Dolores Hidalgo is 40 km away and is worth a visit as it is the birthplace of Mexican independence - and a great place to sample odd ice cream flavors like pork rind and avocado. Querétaro, the capital of the state with the same name is a 45-minute drive away and also has a beautiful world heritage listed old town. This city travel guide to San Miguel de Allende has guide status. It has a variety of good, quality information including hotels, restaurants, attractions and travel details. Please contribute and help us make it a star! This travel guide page was last edited at 12:16, on 20 January 2019 by Wikivoyage user Ypsilon. Based on work by Wikivoyage users Traveler100bot, Anyone150, Wrh2Bot, Crowdblend, Ibaman, StellarD and Ikan Kekek, Wikivoyage anonymous users 187.140.155.169 and 187.134.237.38 and others.